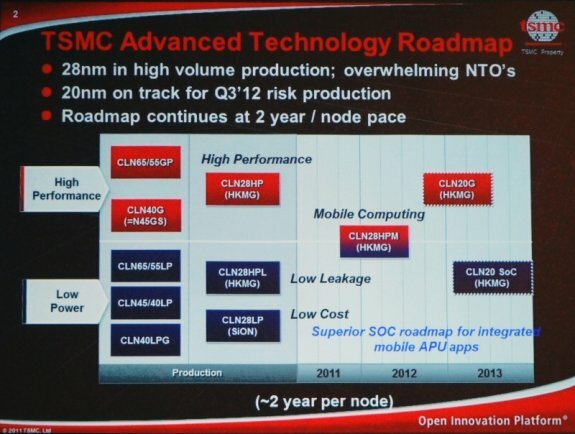 TSCM spoke about its future plans at the TSMC 2011 Japan Technology Symposium and a press conference, you can read about it at Tech-On. At the conference, Jack Sun, vice president and CTO, Research and Development of TSMC, explained about the status of the company's technology development. This time, he spent a relatively large amount of his time explaining about the company's packaging process (back-end process), on which it lays stress. As for process development, while TSMC will keep the pace of advancing by one generation every two years, it is facing challenges such as the delay in throughput improvement of EUV (extreme ultra-violet) lithography and increasing lithography cost caused by the delay..